Pan fried dumplings are easier to make than you think! 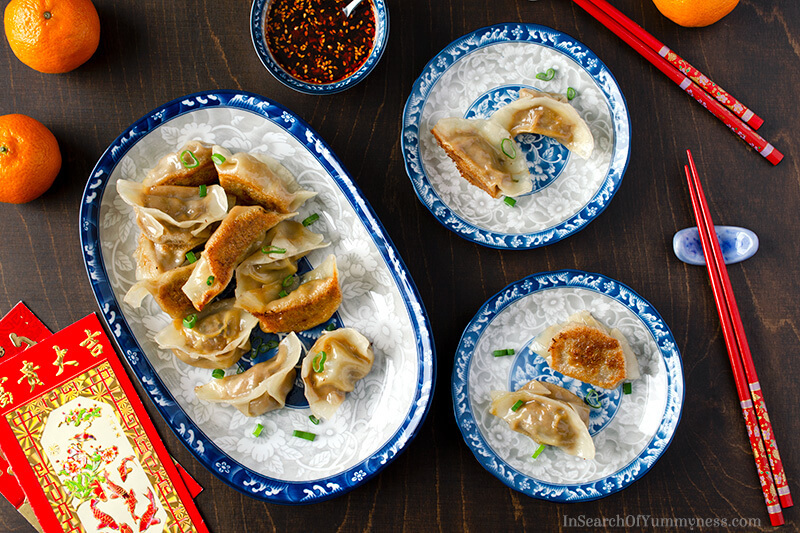 With a little practice, you’ll be making your own Chinese dumplings (Potstickers) in no time. Let me begin this post by saying, if you have never wrapped a dumpling before, don’t stress about how your dumplings look. While fancy potstickers with lots of pleats look pretty, a simple half-moon dumpling tastes just as good! That being said, I have so much respect for anyone who has learned how to properly wrap dumplings. Those beautiful little parcels that you get at the restaurant are probably made by someone who has wrapped several thousands of these babies over their lifetime. Like anything else, practice makes perfect. You should also know that these pan fried dumplings are probably the most tested recipe on my website. Honestly, it has taken me 2 months to get this recipe to the point where I’m ready to share it. My first few attempts at making Chinese dumplings did not go well… not only were my dumplings ugly (which, again, doesn’t really matter, but I wanted them to look good for the photos), but the flavours of the filling wasn’t quite right. After testing out multiple batches, and getting feedback from many taste-testers (thank you family and friends! ), these pan fried dumplings with chicken, mushrooms and cabbage are ready for their debut. Pan fried dumplings are one of my favourite take-out menu items. Or, at least they were, until I got wicked food poisoning from a batch a few years ago. Now I prefer to make these myself. I always use a food thermometer when I’m cooking chicken, so I can avoid giving myself or my family salmonella poisoning. The magic number you’re looking for is 165°F or 74°C. Once you’ve hit that, you know your chicken is fully cooked and safe to eat. 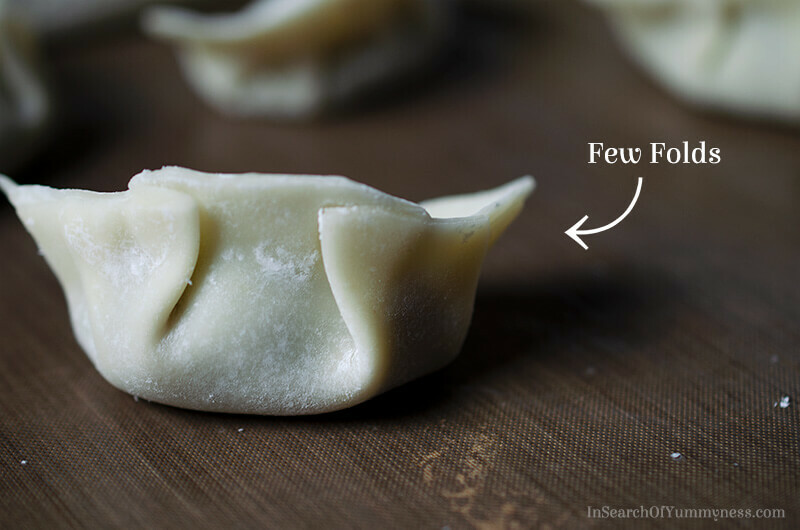 You need to check the dumplings as soon as you take them out of the skillet, or they will cool down and you won’t get an accurate reading. 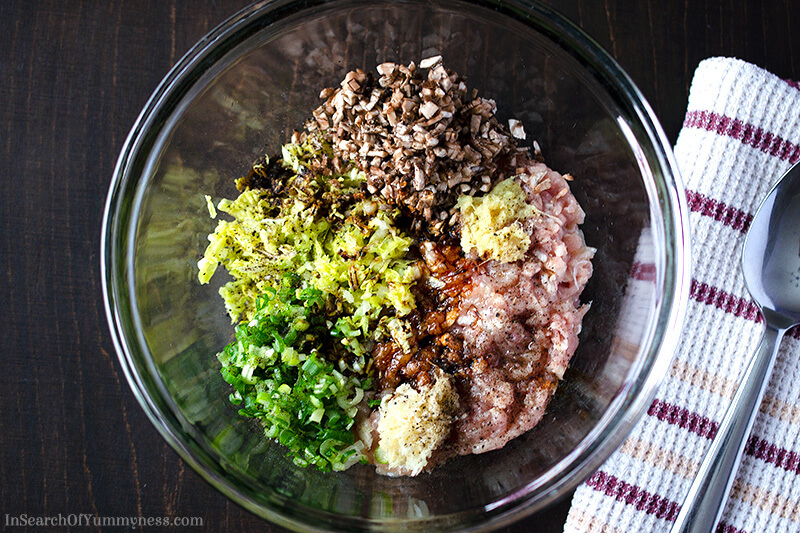 If you’re not a fan of ground chicken, you can use ground pork instead. Actually, ground pork is the classic way to go, and it tends to be fattier which gives the dumplings a nicer mouthfeel. I very rarely cook pork though, so I went with chicken and added some peanut oil to the mix to compensate for the lack of fat in the meat. Once you’ve mixed the filling, it helps to set it in the fridge for a while to chill. You could do at least 30 minutes, but no longer than 4 or 5 hours. When the mixture sat for too long, I found that the flavours didn’t taste as clean. Everything became muddled after a while. The chilling process does help to keep the fat cold until it’s cooked, which gives you a juicer dumpling, so don’t skip that if you can help it. Once your mixture is chilled, you can start wrapping! I found this part really frustrating at first, because I was being a perfectionist. If I can give you any advice, it would be to just relax and have fun with it. Who cares what it looks like? No one is judging you on your folding skills. The easiest fold you can do if a half-moon shape. You literally just fold the round wrapper in half, and press down the edges. It will look like a pierogi, and it will taste just fine. If you’re short on time or patience, this is the fold for you. If you want to get a bit fancier, you can try adding a few pleats to your fold. I followed this lady’s video, and honestly she is the only reason I managed to make anything half-decent in the end. I could NOT get my head around the pleating until I watched her video. It’s not in English, but I slowed the video down in YouTube and I was able to follow what she was doing. If you’re feeling really ambitious, or you already know how to wrap dumplings, then go all in and add lots of pleats. My mom made the dumpling below, and it was so damn cute… yes, I was jealous of her skills. Have I mentioned that she’s never done this before? She just watched Maggie from Omnivore’s Cookbook wrap dumplings in another video, and picked it up very quickly. As you wrap your dumplings, you’ll want to put them in a single layer on a tray lined with parchment paper. This will prevent them from sticking to the surface. You’ll also want to cover the shaped dumplings with a damp cloth or a piece of plastic wrap so they don’t dry out. It will take you a little while to wrap 30 dumplings on your own, and if you leave the wrapped ones open they will dry out significantly. There are different schools of thought when it comes to actually cooking the dumplings. Some people prefer to boil the dumplings first, and then fry them. I didn’t want to do that because I’m lazy (and honest!). I opted for the method that requires you to pan fry the dumplings, then steam them in the same pan, and then crisp them up again. 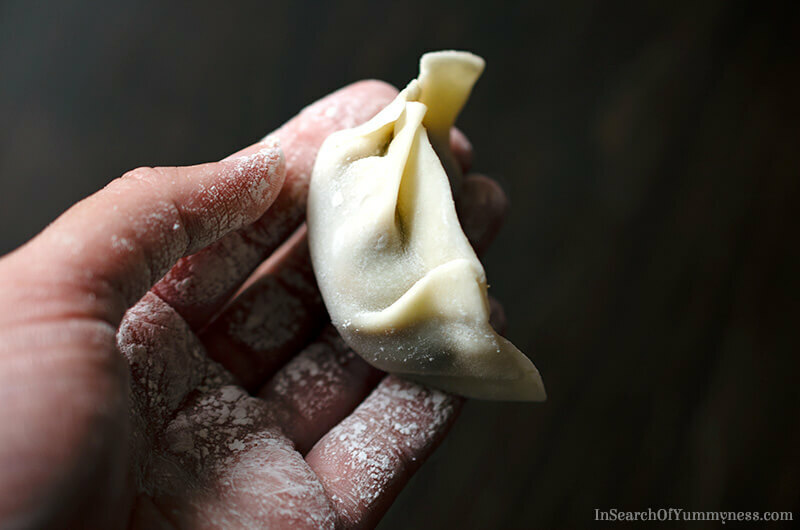 If you’ve never cooked dumplings like this before, it probably sounds counterintuitive to make them crispy and then add water, but trust me this works. Again, it will take a little while to fry all of the dumplings that you wrapped. Don’t be tempted to hold the cooked dumplings in the oven while you fry the rest. I tried this, and they dried out horribly. You don’t want to ruin all of your hard work! If you’re not going to cook the dumplings right away, you can freeze them for later. Just put the whole tray in the freezer and wait until the dumplings are frozen solid. Then you can move them into a zip-top bag or a freezer safe container and leave them in the freezer for up to 3 months. Just be sure to defrost them before cooking. Cooked dumplings can stay in the fridge for a couple of days, but you’ll need to re-fry them, or they won’t be crispy. Serve your cooked dumplings warm, with a dipping sauce of your choice. I went with a classic soy sauce and chili mixture (with some toasted sesame seeds for fun), but you could do soy sauce and Chinese black vinegar (another classic combo), or just plain soy sauce, or just eat them plain. One of my friends thought these would be really good with a creamy goat cheese and chive sauce, so if that sounds like something you’d enjoy you could try that too! If you end up making these, be sure to snap a photo and share them with me on social! You can share a photo on my Facebook page or tag me on Instagram with #InSearchOfYummyness and/or @InSearchOfYummyness. I can’t wait to see your dumplings! Want more dumplings in your life? 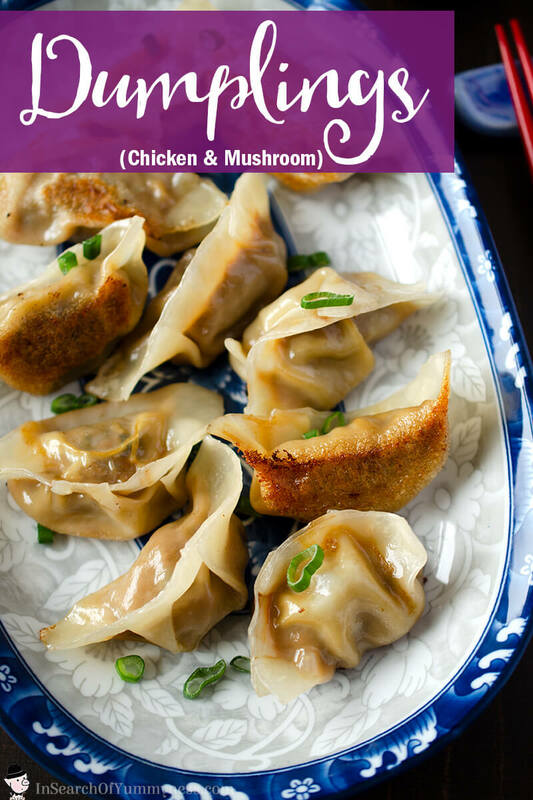 Check out my recipe for fried shrimp wontons with mushrooms. Crispy pan fried dumplings are easier to make than you think! 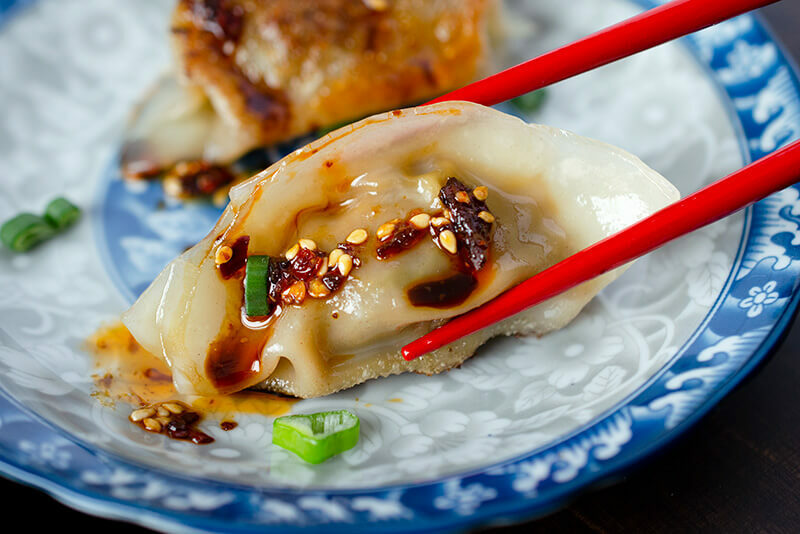 With a little practice, you'll be making these savoury chicken and veggie dumplings in no time. These dumplings are steamed right in the skillet while pan-frying them, so you don't have to go through the trouble of boiling them first. That's one less step, and one less pot to wash! Sprinkle cabbage with salt, stir and set aside for 20 minutes. Squeeze excess liquid from the cabbage. Strain, discard liquid, and add to a large bowl. Add the rest of the filling ingredients to the bowl. Mix well to combine. Place mixture in fridge to chill. 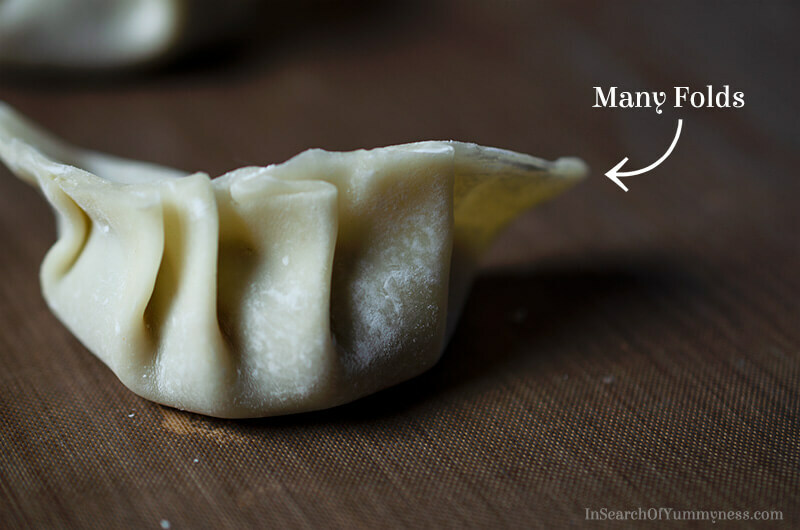 To assemble the dumplings, peel one wrapper off the stack and place in the palm of your non-dominate hand. Add about a 1/2 tbsp of filling to the center of the dough. Use your finger to add a little water to the edge of the wrapper. 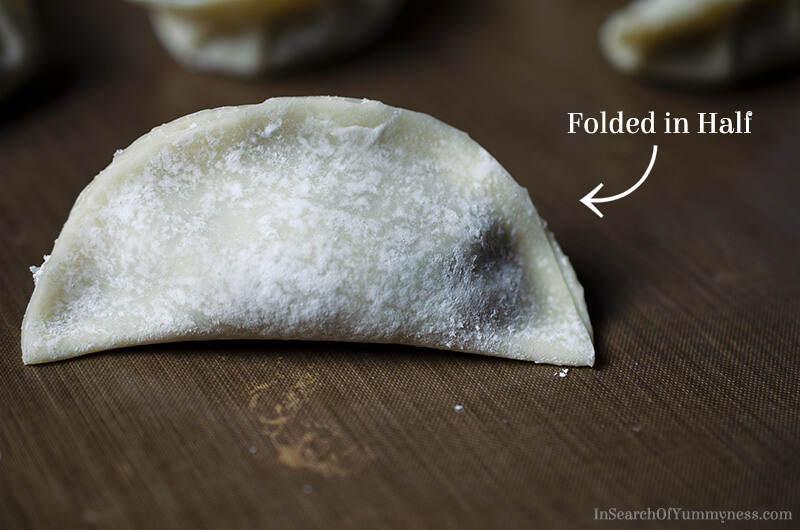 By making the edges damp, it will stick together when you fold the dough. Fold the dough in half, and pleat as desired (see note for tips! ), making sure to press the edges together to create a tight seal. Use your fingers to slightly curve the dumpling, making sure the bottom is flat, so it can sit in the skillet. Place the wrapped dumplings pleat side up on a plate or tray lined with parchment, to prevent sticking. Cover with plastic wrap or a damp towel while you make the rest of the dumplings, so they don't dry out. Continue wrapping your dumplings until you use all of the wrappers (about 30 usually) in the pack. Leftover filling can be rolled into meatballs and fried. Combine all ingredients in a small bowl, and set aside. Place a non-stick skillet with a lid over medium-high heat. Add 2 tsp peanut oil to pan, and allow to heat up. Place about 8-10 dumplings (depending on the size of your skillet) flat side down, and pan-fry for 2-3 minutes, or until golden brown. 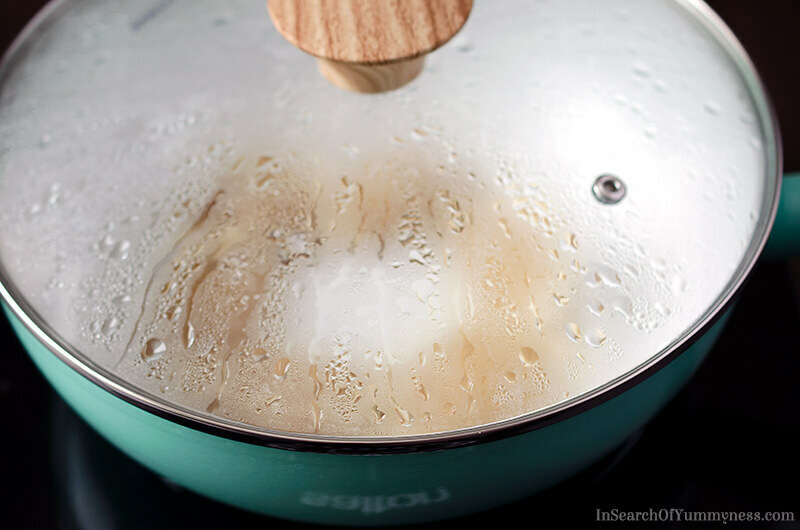 Add 1/4 cup water, then quickly cover with lid to trap the steam. Steam for 4-5 minutes, or until most of the water has evaporated. Remove lid, add more oil if needed, and fry for another minute or two, then remove from skillet. Check for an internal temperature of 165F/74C to ensure that chicken is fully cooked. Repeat until all dumplings are fried. Serve warm with the dipping sauce. These dumplings are traditionally served with soy sauce mixed with chili oil, or soy sauce and Chinese black vinegar. But you can serve them plain, or just with regular soy sauce if you prefer! Uncooked dumplings can be placed in a single layer on a tray lined with parchment paper, and frozen for later. Once the dumplings are frozen, you can transfer them to a zip-top bag or freezer-safe container, and use within 3 months. To cook, defrost the dumplings and then cook using the regular instructions. Cooked dumplings can be stored in the fridge for up to 2 days. Reheat in the skillet to re-crisp or they will be a bit soggy. Thank you to Dianne for helping with the recipe development, wrapping dumplings after dumpling, and remaking the filling for the photoshoot multiple times! Thanks to Amanda for not only taste testing, but making the goat cheese & chive sauce suggestion too!